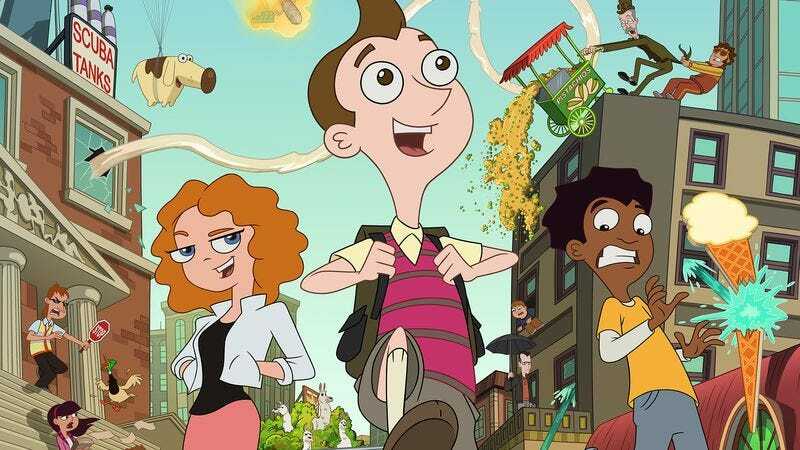 Earlier this year, we learned that “Weird Al” Yankovic would topline the voice cast of a new Disney XD show, Milo Murphy’s Law. The animated series centers on the titular Milo (Yankovic), whose bad luck is genetic. But he’s a plucky kid who’s always “expecting the unexpected,” like having a wrecking ball suddenly drop right in front of him on his way to school. That sounds mighty stressful, which is why it’s a good thing he has two best friends, Zack and Melissa (MeKai Curtis and Sabrina Carpenter, respectively), as well as a backpack filled with all the stuff he needs to confront daily disasters. Yankovic will contribute some original songs, but he’s already released the opening theme. With the opening credits in place, Disney XD has announced that Milo Murphy’s Law will premiere on October 3. A preview of the first episode will be available on Disney XD’s online and mobile channels on September 26. The rest of the cast includes Sarah Chalke, Jemaine Clement, and Christian Slater (as a character named Elliot, interestingly enough). Diedrich Bader and Pamela Adlon are voicing Milo’s parents, who will presumably have a litany of things to warn their son away from. Agents Of S.H.I.E.L.D.’s Ming-Na Wen is playing a “high-level time-travel agent,” because no kids’ show is complete without some spacetime diversions. But should a kid who’s plagued by bad luck really go fussing about in the past or future? We’ll find out this fall.